A unified group of Democrat officials spoke out in favor of saving the current Healthcare law. Included were Pct. 1 Commissioner Rodney Ellis, Congressman Al Green, State Rep. Armando Walle, Congressman Gene Green, and State Sen. Sylvia Garcia. The conference was held at the Greater Jerusalem Baptist Church on Jensen, in memory of Martin Luther King Day. 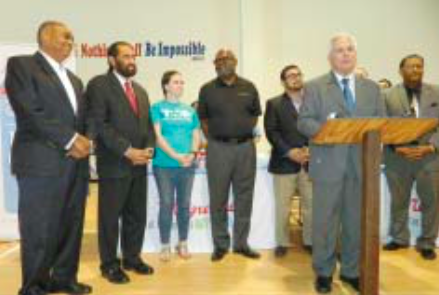 HARRIS COUNTY – Federal, state and local Democratic office holders held a joint news conference, and health fair, on Sunday at the Greater Jerusalem Baptist Church on Jensen Drive. The purpose of the meeting was to call attention to the possibility that the Republican led Congress will change or eliminate the current ACA healthcare program, also known as Obama Care. Walle said that as a member of the budget committee in the state legislature, he is working to keep the ACA program and expand Medicaid. He angrily denounced what he termed failed leadership at the state level. He characterized the need for the ACA act as a matter of Life and Death, and the public need the vital health coverage that the state is withholding. He reminded the audience that the main beneficiary of Medicaid is the elderly and children. Commissioner Rodney Ellis, recently elected to his position in Harris County Precinct 1, said that the ACA act is the most important issue facing the county, because healthcare is the largest item in the budget, with the justice system following second. However, he noted that much expense related the administering the justice system, and jail, is related to healthcare costs. 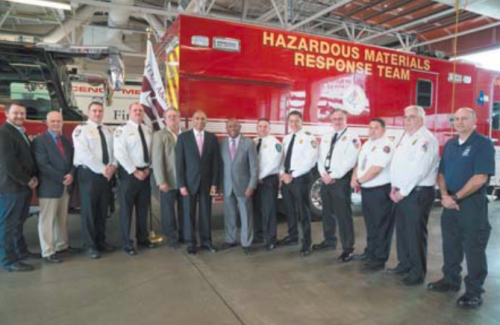 HOUSTON, Jan. 13, 2017 – LyondellBasell (NYSE: LYB), one of the world’s largest plastics, chemical and refining companies, announced a donation of $100,000 to fund specialized emergency training for six Houston-area fire departments that serve key industrial corridors. The donation will underwrite hazardous materials (HazMat) training scholarships for fire departments in Houston, Channelview, Pasadena, La Porte, Sheldon and Mont Belvieu. Texas A&M Engineering Extension Service (TEEX), an internationally recognized leader in emergency response training and firefighting, will administer the training to the fire departments. HOUSTON — More than half of the star-studded entertainer lineup scheduled to perform at RODEOHOUSTON will take the rotating stage for the first time in 2017. Tickets went on sale Saturday, Jan. 14 through AXS Ticketing via rodeohouston.com.